Standout Tidbits: Not really any to speak of. Review: I realize that I have gone on public record as stating that my favorite type of pizza is a big, greasy, foldable slice of New York-style thin crust. However, when it comes to the so-called War of Pizza, the battle of NY-style versus Chicago-style, consider me Switzerland. When I say “pizza tastes good,” I don’t discriminate against style. It’s all about substance. On Easter Sunday 2005, Robin and I found ourselves returning to Denver from a brief, morning trip to Boulder. We were very hungry and couldn’t find anything that was open and not packed with a fancy-dressed, post-church, Easter brunch crowd. Driving past Westminster, CO. we thought we were going to have to resign ourselves to Sweet Tomatoes, a huge salad-with-soups-taters-pastas-and-desserts bar (they also have french bread pizza that will be reviewed another time). Nearby, I noticed there were cars outside “Uno Chicago Grill” so we headed in for some deep-dish. 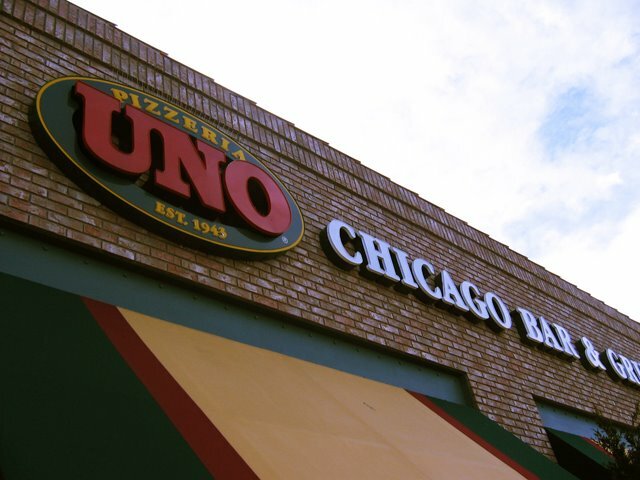 Pizzeria Uno is credited with inventing deep dish pizza in Chicago back in 1943. 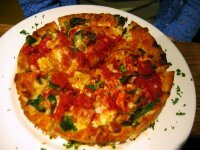 It became so popular that they were forced to open a second location just across the street which was called Pizzeria Due. Over 60 years later there are 200+ locations across the country. Pizzeria Uno now operates under the name “Uno Chicago Grill” in what I interpret to be an attempt to tap into that virgin territory of the major-chain-suburb-neighborhood-bar niche. When you walk in the door, you could be walking into a Bennigan’s, Applebee’s, Chili’s, T.G.I. Friday’s, etc. The wood may be a little darker, the framed posters may have more of an italian food or Chicago slant, but you get the picture. Simpson’s fans can simply think “Uncle Moe’s Family Feedbag.” A pizza-heavy menu has given way to the standard steaks, ribs, chicken wings, fancy foo-foo cocktails, and crazy desserts fit for a whole family. Of course we were there for one thing, the pizza. We each ordered a small pizza “for 1.” I got a straight-up cheese and tomato sauce pie, and Robin ordered a “Spinoccoli” with spinach and broccoli. I must say that both were delicious. Uno builds their pies in an order some may not notice or be used to. Instead of going dough, sauce, toppings, and cheese, Uno starts with the dough in the pan, then adds the cheese, then toppings, and finally covers it all with the sauce. True to Chicago-style the cheese and toppings are quite plentiful. Native Chicago-ans will claim that pizza is a meal and meant to be eaten with a fork, and not with your hands, and this pie lives up to that specification. The crust was very buttery and pastry-like. The oil coating the inside of the pan had made the outer crust slightly browned and crisp while the inner crust was still soft and slightly chewy. The toppings were quite fresh and not overcooked to the point of losing their flavor. The cheese was tasty and the perfect gooeyness. Finally, the sauce was amazing. It was very chunky, without being just tomato chunks, and quite seasoned without losing the full flavor of the tomatoes. Quite often, I have found the sauce on Chicago-style pizzas to be too sweet. This was certainly not the case. Although the setting wasn’t the greatest, the restaurant was clean, the service was good and attentive (how can it not be with only 2 other seated tables in the joint), and the food was exceptional. If there was a location closer to our home, I could see us getting carry-out or even stopping by about as often as we give in to our cravings for Red Robin veggie burgers and shakes (about once every 2 months). This entry was posted in Chicago-Style, Good, Pan / Deep Dish and tagged Chicago-Style Deep Dish, Good. Bookmark the permalink. If you’re inver in Chicago, try Giordano’s pizza. It’s a milliong times better than Uno’s and way less chain-y imho. Thanks or the tip. I’ll give it a taste next time I hit the Windy City. I used to work for a place that made stuffed crust pies. Good stuff. Pun intended.